For "SALES" dial extension #2. Diversiboard is a one-of-a-kind steel panel surface designed for use in the classroom or boardroom. Diversiboard has two options. 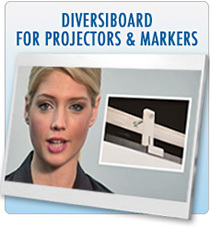 The first option, known as “PB” or Projector Board, offers a matte surface and is ideal for use with a projector. The second option, “MB” (Marker Board), is designed to add marker board space and carries a glossy surface. What is most unique about both boards is that they are designed to work on our patented Diversitrack track mount system and Diversimount , our stationary wall mount system!